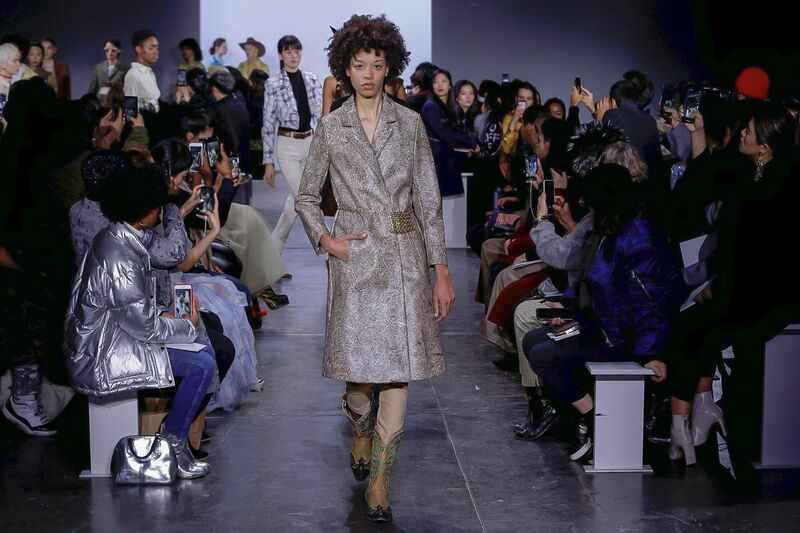 Another great show took place at New York Fashion with Mark Gong showcasing his ready-to-wear Fall/Winter ’19 collection. Gong seasoned a refreshing twist on the “Wild West” aesthetic. Instead of the true grit of American west, embracing the mixture of masculine and feminine elements into the collection was a no-brainer. Scroll to see the collection. Cowboy hats and boots were a steady aesthetic throughout the show. Accenting and pairing them with delicate daytime prairie dresses, structured androgynous silhouettes and of course the cuddly oversize coat. There was much experimentation and use of plaid prints and different textiles presenting wearable and functional bold looks. Not only did Gong played with prints, he also married them with neutral earth tones creating a subtle but eye-catching sensibility. Mark Gong originally landed in California a mere five years ago to attend high school. During his time there, the school did not provide internet services to assure students focused on their studies. With little connection to the outside world, and with limited fluency in the language and culture, Mark felt as if he were thrown into isolation. He spent day after day in his small paneled room, deep in thought and introspection. The school, with all of its rules and regulations, suffocated his creative side, pushing him to look elsewhere for the source. It was during this long dark period that it dawned on Mark to lean on clothing and design, as an expression of his emotions. He began with simple sketching and remained in constant search for inspiration. It was there, in the vast outdoors that he found true solace and ingenuity. Soaking in the natural beauty opened his mind and horizon to a colorful future with dancing silhouettes. Currently as a student at Parsons: The New School, Mark Gong draws on fashion as a medium to convey his vision of life, history, and culture. Within just three years he has managed to create four seasonal ready-to -wear collections, all while managing and growing his business. Mark Gong’s concept is to mold out an independent and unconventional women in the most beautiful manner possible. His brand represents creativity, grace and comfort. But simple, yet sophisticated and distinct. What did you think about this collection and what was your favorite look? What a gorgeous collection. Love the coats. Same here. Glad you liked it too!